Southeast Arizona parks and historic sites are not as well known or frequented like the Grand Canyon but have their own charm that will delight you when you visit this part of Arizona. The better known park in this part of Southeast Arizona is Kartchner Caverns State Park. But we have many guests from Arizona that have never heard of it. Tombstone is a National Historic Site best known as the site of the Gunfight at the OK Corral. For some reason, the majority of parks in Southeastern Arizona are one of the best kept secrets around. 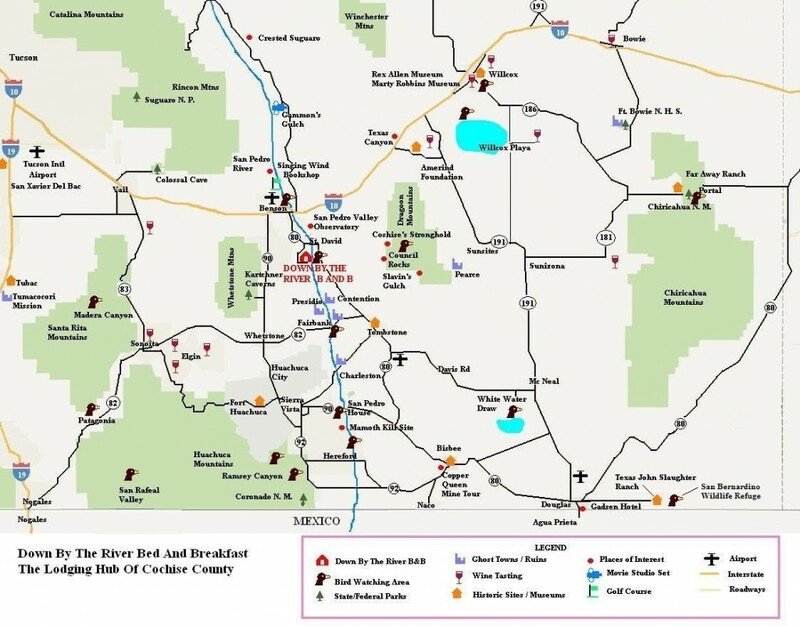 So let me give you a quick review of places that you can visit here in Southeast Arizona. 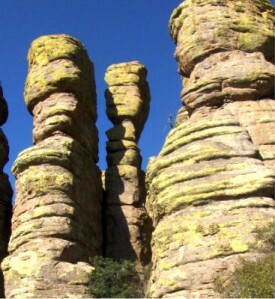 Chiricahua National Monument encompasses a volcanic formation from the Turkey Creek Caldera that erupted millions of years ago. Over time the elements have worn down the rock to form many interesting rock features similar to Bryce Canyon only to a smaller scale. The color of the rocks is not orangish red but shades of browns, grays and whites. Many of the rock features have names such as balance rock, Punch and Judy and Duck on a Rock to name a few. It is almost to the New Mexico Border south of Willcox. Fort Bowie National Historic Site is east of Willcox about 20 miles just off of Interstate 10. This is the location that was a focal point in the Apache Indian Wars here in Arizona. The actual incident that started the hostilities happened near the ruins of Fort Bowie. Originally the Fort was placed here at Apache Springs to guard the water for the Butterfield Stage line. The old stage road can be seen at this location. Ruins of the stage station, a graveyard, the Jefford’s Indian Agency ruins and the old fort can be explored during your hike into the visitor’s center. 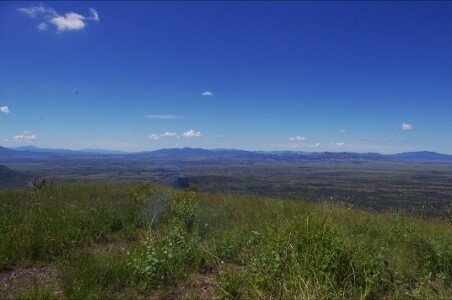 From the top of Coronado National Memorial looking to the Southwest into Mexico. Coronado National Memorial is located at the southern end of the Huachuca Mountains. The site celebrates the Coronado Expedition that entered Arizona along the San Pedro River in their search for Cibola – The Lost Cities of Gold. From the high point in the monument you can look out over the San Pedro Valley toward the Peloncillo Mountains where Geronimo surrendered. Looking south you view Mexico and the foothills of the Sierra Madres. To the west you can see about 80 miles to Baboquivari Peak, a sacred mountain to the Tohono O’odham peoples south of Tucson. There are many other smaller Southeast Arizona parks and sites to visit when you come to Cochise County. Staying at Down By The River will also not disappoint you. Enjoy the parks all within a short drive time to Down By The River with the seclusion and quiet that can be found here in St. David, AZ. So read up on the area and find out what the well kept secret is and enjoy it.